Welcome back to the Digistor Blog! This month I’d like to provide an overview on one of our products that is starting to gain some traction in Australia – Snapstream DVR. Some of the most visited media sites (like Buzzfeed, Slate, Yahoo News, Politico, Vox, Vice) and others. SnapStream has been in our region for a couple of years now, and there have been some recent hardware updates and storage options, including an exciting new Cloud Offering in Australia. So, who are SnapStream? – What do they do? Who would use it? How does it work? SnapStream is a Houston based company which make hardware and software that enable users to take any video feed (Broadcast TV or in-house video) and Distribute it over the LAN to any device in the organization, record those feeds to a centralized DVR, Search inside recordings (using Closed Captions), create Clips, and then Share on Social Media. Corporate Compliance – some companies have a requirement to retain an off-air recording of any content that involves or refers to that company, be it for legal or historical purposes. SnapStream can capture this content and store it locally for as long as it is required. 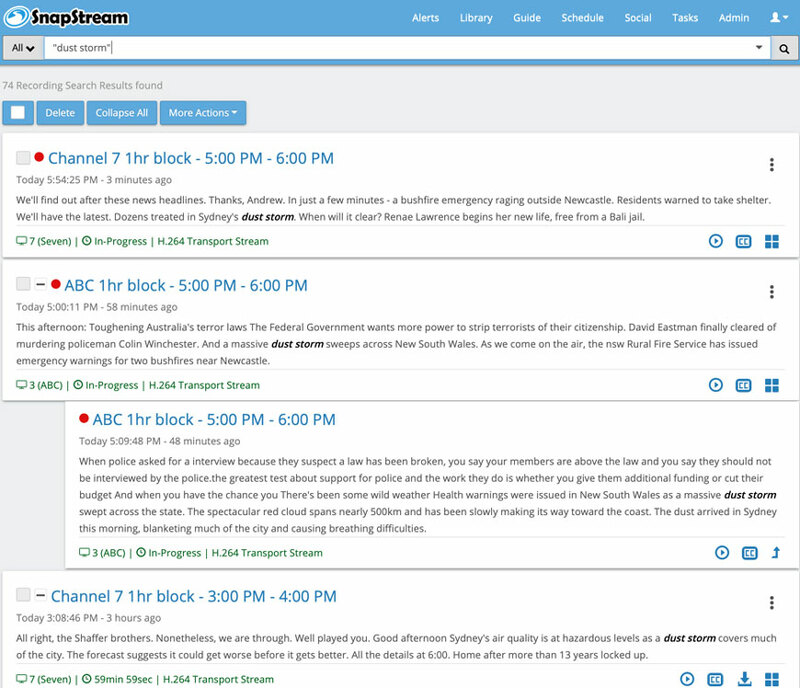 Others use SnapStream to provide feedback to advertisers, confirming their content was aired at the right time on the right channel and at the expected quality. Current Affairs shows – have you ever wondered how TV shows like The Weekly with Charlie Pickering find all the random clips they use in their show? 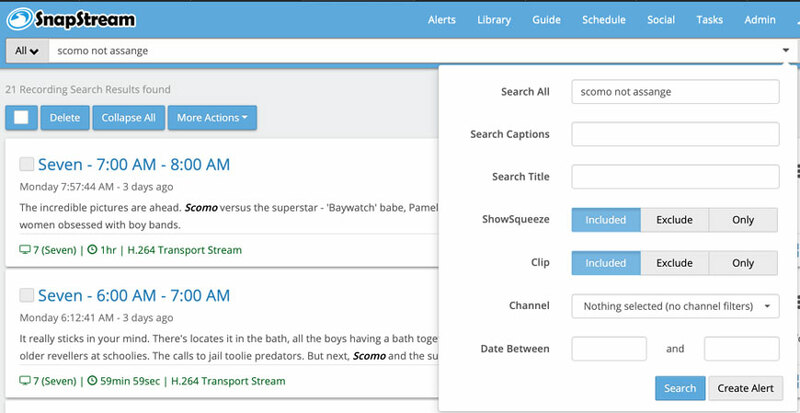 They use SnapStream to record content off air, from which they are able to efficiently search through hundreds or even thousands of hours of media by the caption metadata and quickly locate any content related to a particular subject matter. 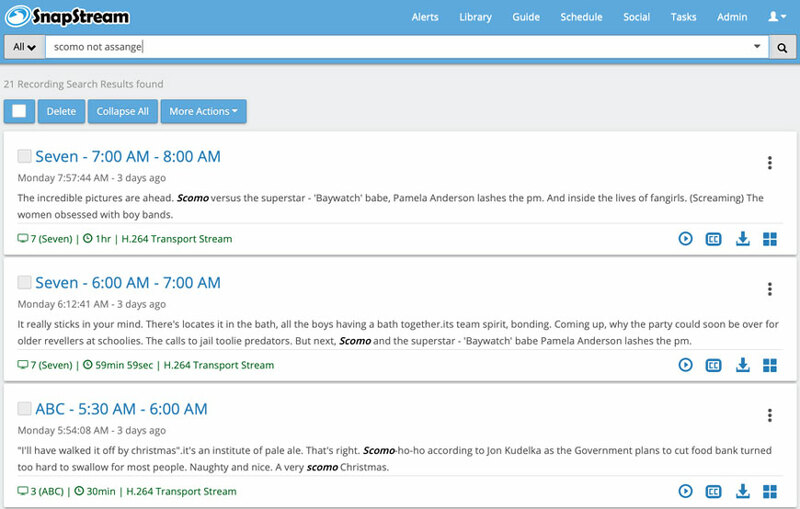 TV Monitoring for Government Agencies – instantly pull up search results when a crisis arises that impacts your organization or connect to a closed-circuit municipal channel for the monitoring of actions. You can even post breaking news to followers on social media channels. Transmission Monitoring for Broadcasters – things may look ok in the Playout Suite, but there are issues further down the chain – Snapstream can record this and assist fault finding. 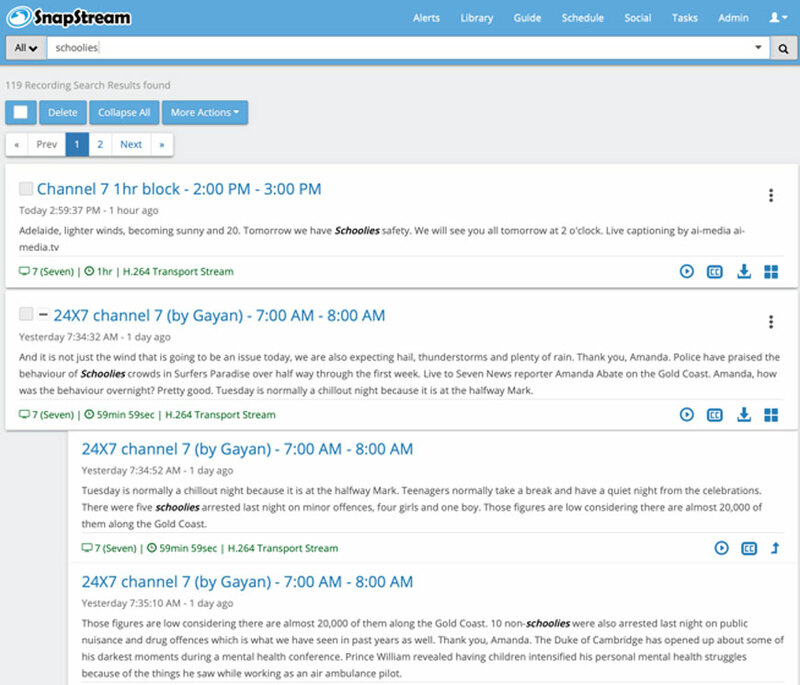 Snapstream can also be used conjunctively with social media to have a more live interaction with your audience, uploading to Twitter, Facebook, etc while a show is airing. Social media teams at TV networks and entertainment website can post video clips, GIFs and screenshots to Twitter, Facebook, YouTube direct from live tv. Creating and posting a clip takes seconds. You can also schedule posts to go out for later. SnapStream recently added square and vertical cropping so that social media teams who want to create content for Instagram and Snapchat can create content that is optimized for those platforms directly in SnapStream. I hope this is starting to get you thinking about some of the many applications for Snapstream. Searching by caption data – as shown in the images above, it is very easy to search by any term, but we can also do advanced searches in several manners. We can be as simple as adding ‘not’ between two words to search for one, but not the other in a particular clip. We can also use wildcards and various other functions. Look carefully below at the search criteria and the results. Time ranges can be set, types of media or channel restrictions to further refine our results, as well as saving that search so an email alert is sent whenever the criteria is met – how cool is that! Automation and Alerts – well we just touched on this with alert emails, but there are many more workflows we can setup on a Snapstream. All of the above examples can be automated so only the required content is retained, etc. Workflows can be triggered by specific events, including such like Recording Finished or File Uploaded. 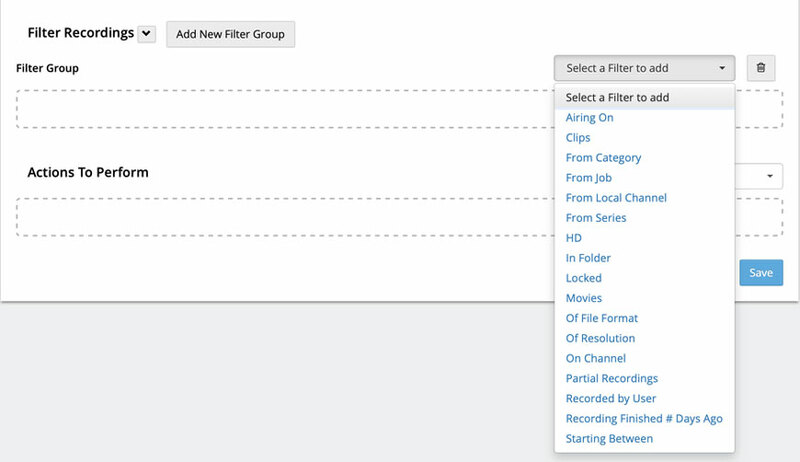 We can then add filters and actions to these trigger conditions, such as automatically sharing to social media, transcoding and generating a transcript of the captions. 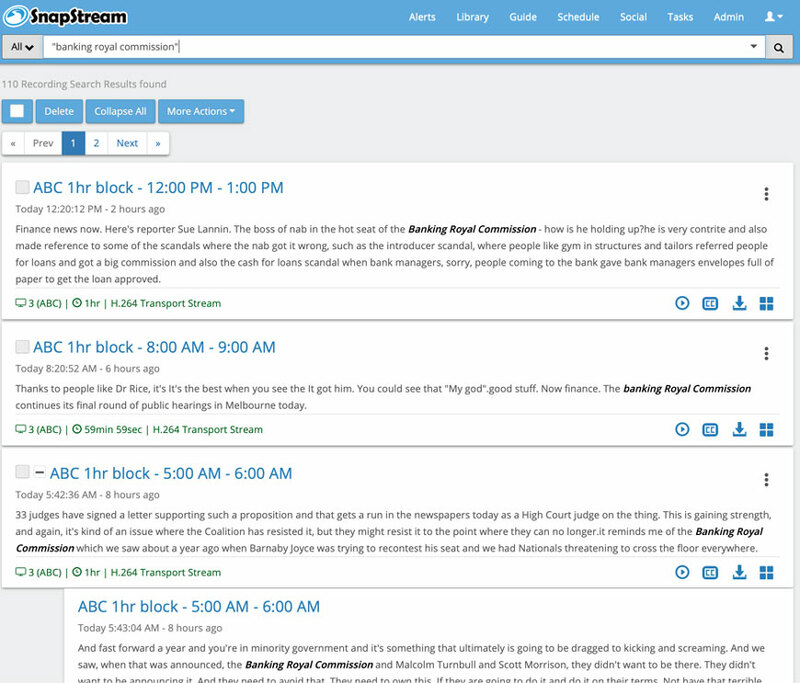 As you can see, there are a lot of options and we can go into much more detail, but this is just a quick overview with a few images to highlight the intuitive interface Snapstream have developed. While all this functionality is very interesting and well thought out, I am most interested in Snapstream’s new cloud offering, which reduces the onsite hardware footprint while giving the ability to share with anyone in any geographical location that has an internet connection. Snapstream Cloud basically uses a locally based encoder to record content and stream it to the cloud. There are various transcoding options that can be applied, depending on your bandwidth and quality requirements. Once in the cloud, content can be shared with anyone and individual access to the cloud instance can be tailored to suit your policies or client requirements. Snapstream have kindly provided the Digistor team with an encoder and cloud instance that we can arrange access to for anyone who wishes to have a closer look at the integration and functionality. All of the images above have been pulled from this instance and only show a couple of the many channels that could be recorded and searched. So, what are our current limitations? There are only two limitations that I see as notable and they are to do with Foxtel off-air. 1 – Foxtel uses HDCP on its HDMI output and there are some restrictions in our region. Currently we can only record Foxtel in SD, but Snapstream and Digistor are working on a HDCP compliant encoder that will allow recording of Foxtel in the same resolution as FTA, and we are very close to a solution. 2 – The other limitation is the caption data in the Foxtel signal – Foxtel STB’s strip the caption data from their stream and only provide it as open captions that are burnt into the Set Top Box output. Overall, I am impressed with the growing potential of Snapstream and their continual dedication to improving their offerings in our region. I encourage anyone interested to check out Snapstream’s website to see various other use cases and functions that I have not included in this article. If Snapstream is of interest to you, please contact the Digistor sales team for a live demo, options and pricing on the various offerings available.